Leisure Facilities situated in Looe These are situated at Hannafore Point, West Looe, right on the waters edge and opposite Looe Island. We have access to leisure facilities with indoor heated pool, sauna, pool-spa and well equipped gym. The beach below is a maze of rock pools, with a wonderful selection of hermit crabs, beautiful colourful sea anemones, prawns, crabs, limpets, sea slugs, little fish, snails, etc. Use of the swimming pool, spa bath, sauna and gym are included in your cottage rental. You will be given a pass to identify you. 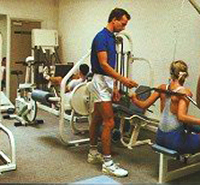 The gym is available, for over 16 year olds, after a first evening of instruction. Along the sea front, there are tennis courts (bring your rackets and balls) and a bowling green. Parking is reasonably easy, even in the middle of the summer, and the coastal footpath leads West along the coast.